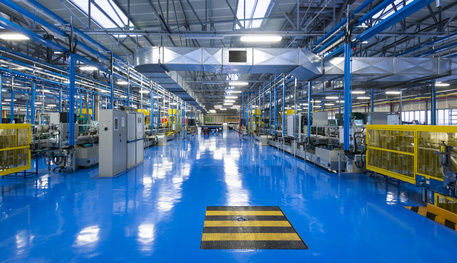 Factory cleaning a specialist cleaning service as many factories cannot allow downtime and therefore must be completed out of hours or ensure cleaning does not affect production. All out team are specially trained to adhere to health and safety regulations above and beyond requirements. Dirt Busters Commercial cleaning has a great deal of experience in factory cleaning projects and a company you can trust. As every facility is different, we work with you to understand your requirements and then devise a cleaning regime to cover floors, work surfaces, ceilings and even equipment. We work with you to minimise disruption to services working overnight, very early in the morning or over weekends depending on requirements. We also ensure that our team receive all training to clean down any machinery or equipment as required by you. When one thinks of factories, one imagines a giant construction with machines whirring and running all through the day. Factories support the national and local economy and offer job opportunities to many. The constant churning and flurry of activities, layers of dust, grime, and contaminants can build up over a period of time. Quite naturally, factory cleaning is necessary for the upkeep and maintenance of the factory. Factory cleaning is also vital not only to maintain sanitary condition but also to adhere to the standards expected at the site. However, factory cleaning could result in downtime where all manufacturing and production activities could come to a standstill. Each day spent in factory cleaning could result in great loss hence the cleaning activity should balance the time taken with the thorough cleaning. Dirt Buster does precisely that. Our team of cleaners are specially trained to conform the health and safety regulations that is way above the bare minimal or mere satisfactory. At the same time we take just enough time that it does not result in an inordinate delay. We use every bit of our experience garnered through years to offer you the service that will leave you impressed. All in all, you can blindly trust Dirt Buster’s commercial cleaning services. Before we begin the process, our team of experts will visit the factory and gather information about the site. We know that all factories are not the same and thus, our team will understand your requirements and expectations from our services. Once the data is collected, we will formulate a cleaning regime to cover every portion, whether work equipment or air ducts. This proposal will be further discussed with you to work out the scheduling of the cleaning activities. You can have our cleaners working overnight or over weekends, or in the wee hours of the morning. As per your request and availability, we will tailor a cleaning routine customised for your factory. We shall carry out the operation keeping your factory timings in mind so as to cause minimal disruption to routine activities. With Dirt Busters you no longer have to worry about the adverse effects of downtime! Each portion can be cleaned at once or in sections based on your demands. Furthermore, we understand that your equipment forms the backbone of your factory and therefore, we will take utmost care while keeping them free from dirt and debris. You don’t have to worry about accidental damage to any of your goods and machines. We will go out of our way to deliver on our promise. In fact, our cleaning team will receive dedicated training specific to your equipment before we execute the cleaning procedure in your factory. This training would be solely to meet your requirements and how you want your machines and equipment to be cleaned by our staff.